These are exciting times for Rory Gallagher fans. With the last of the remastered solo albums making their way into the record shops, the media outlets are now a buzz with word of a new project soon to be released that promises to knock the socks off the Gallagher faithful. The new project boasts a total immersion into the crime story songs of the late Rory Gallagher, including a Rory inspired novella by famed crime author Ian Rankin . It was something that was hinted at in last April’s release of the Continental Op EP on record store day. On the inner sleeve of that EP was a b&w comic book style collage of crime noir scenes with the words “Coming Soon. Kick Back City. Starring Ian Rankin, Timothy Truman, and Aidan Quinn.” And now we learn the specifics. Set to be released in late October, the project combines the talents of the U.K.’s number one crime fiction author, Ian Rankin, writing a Rory-inspired novella, with graphic artist Timothy Truman illustrating, and award winning actor Aidan Quinn providing narration. Add in a hefty dose of classic Rory Gallagher numbers and you’ve got a witches brew with more punch than the great Clones “Cyclone”, Barry McGuigan. And we’ve got Daniel Gallagher, son of Rory’s brother Donal to tell us all about. Shadowplays: Hi Daniel, thanks for taking time out from your busy schedule to answer a few questions about the latest re-releases and the upcoming release of Kickback City. And what a busy time it’s been. Let’s start out with the reissues. Towards the end of last year the second batch of remasters was released, the albums from Rory’s time at Chrysalis. Once again ANDY PEARCE and MATT WORTHAM went back to the originals? Daniel Gallagher: Hi Milo, my pleasure! Andy Pearce is very highly regarded for not over compressing and joining the ‘loudness’ war that currently perpetuates in the music industry and this keeps the sound quality of Rory’s recordings at the forefront be it the professional, almost mainstream sound of Calling Card or the very lo fi Deuce. Once we’d started the re-issues with Andy and Matt it was definitely the right thing sonically for all the albums to subsequently be mastered by them from the original 1/4 inch tapes. Shadowplays: The original artwork from Jinx has returned, along with the proper tracklisting! Any idea why the late ’90’s remix had scrambled them so bad? Was it because of the popularity of Big Guns in concert and so they decided to capitalize on that fact and put it at track one? Daniel Gallagher: Jinx would of been the first Rory album I got, I remember my Dad giving me a copy on tape when I was quite young and it’s stayed as a personal favourite of Rory’s records (only beaten Deuce and Irish Tour). I didn’t realise the track listing had been so jumbled up over the years, the obvious solution was to go back to the initial order. I think it was Rory who altered the track list for the Intercord re-release in the late 80s, I do suspect that Big Guns’ popularity live had a part to play in the track becoming the opener. Shadowplays: Jinx, a forgotten masterpiece. Some great lyrics on that album. No wonder Geraldine Creedon included so many bits of the lyrics from Jinx on her abstract sculpture. I like the additional write-ups from Cameron Crowe and Simon Frith on the album Against the Grain, and nice to hear once again the missing bridge from the song Ain’t too Good. Any idea why it was edited out of the 1999 remaster? Daniel Gallagher: For all the re-issues I tried to find relevant reviews or articles to go with Donal’s track descriptions, and that Cameron Crowe article is a wonderful insight to Rory and the period of Against The Grain where he’d just signed for Chrysalis and was gracefully doing a lot of ‘promo’ work for the album which he probably hated. The missing bridge vocal on Ain’t Too Good from the 90’s remix was a mistake at the time, Tony Arnold mixed the track without the vocal which was then corrected but the wrong master tape got sent to manufacturing and it wasn’t noticed on the test pressings. It’s great that we got the chance to correct things like that with these releases. Shadowplays: There are some great additional photos in these re-releases. Love the extra “Philby” live shot on the remastered Top Priority. Was that the photo from the Philby “single” that was released back then? Daniel Gallagher: Yes that is the shot from the Philby single cover. 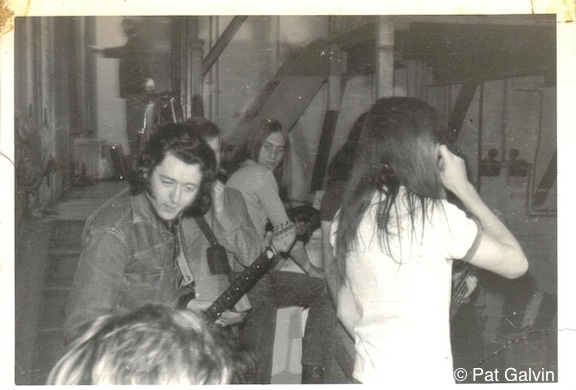 That photo session is by Brian Cooke it has Rory, Gerry and Ted in a dark rehearsal room with stage lighting and it looks like they’re having a lot of fun jamming and throwing shapes. 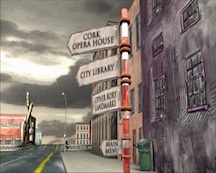 Shadowplays: Most of the bonus tracks returned on these re-releases with the exception of Calling Card where a new bonus track, “Where Was I Going To” replaces the previous bonus tracks. What’s the history behind that little gem? Daniel Gallagher: I’ve tried to keep the bonus tracks relevant to the album they were recorded for and moved tracks from certain albums to where they ‘belonged’ such as ‘Just A Little Bit’ to Irish Tour from Tattoo. With Calling Card the previous bonus tracks had been from the Notes From San Francisco sessions and I felt after the release of that album that I’d take these off the album. I looked through the tapes for any unused track and came across ‘Where Was I Going To’ on a Blueprint sessions tape and cheated my rule of keeping the bonus tracks with the relevant album and mixed it for Calling Card. It’s a great whimsical track with some fantastic Lou Martin piano and a Serge Gainsbourg bass line. The song didn’t make Blueprint originally because I don’t think Rory had finished writing it, there was no lead guitar, the recording is actually nearly 8 minutes with the band going round and round trying to work out how to finish with Rory trying different lyrics. I edited it and tried to encapsulate everything the song intended to be and at 5 and a half minutes it feels pretty complete, to me anyway. Shadowplays: Fairly seamless editing. Though I’d love to hear the actual recording of them working on the song, get a glimpse on how a Rory tune is crafted. Shoot, a Rory practice session would be far more interesting than most of the stuff you hear on the radio these days! Overall, How have the remasters, the Polydor and the Chysalis sets, been received by the fans? Because of the years involved I’d assume a higher demand for the earlier Polydor’s. Daniel Gallagher: I was slightly nervous that some people might feel it was unnecessary to remaster the albums again but thankfully the response I’ve had has been very positive. The mastering is a lot ‘gentler’ than the previous masters which were quite loud, I think Rory’s production and mixing nuances come through better sonically and while Rory’s mixes might not be the 100% clean perfect for radio it’s how he wanted his albums to sound and how he wanted people to hear them. Both sets have done very well though I think the initial demand for the Polydor releases was slightly higher than the Chrysalis albums, in part that’s down to them having more of a legacy, classic front covers such as the Mick Rock photos etc. It also just comes down to the first set of releases in a series getting more attention, press and retailer wise, than subsequent sets. 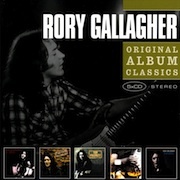 Shadowplays: I understand that Sony had also done a Rory “Original Album Classics” series too. A bargain box set containing 5 of his albums (Deuce, Calling Card, Top Priority, Jinx & Fresh Evidence) I don’t recall this coming out in the states. When and where was this released? Daniel Gallagher: I think Sony did this back in 2008 for Europe, I think they were looking to get Rory into supermarkets racking and thought a bargain box set would work. Personally I think these items slightly ‘de-value’ Rory’s music that’s why I prefer doing something like the full re-issue series that gives prominence to the music at a very reasonable price. Shadowplays: And that’s one of the great things about these new remasters, not only do you get a great sounding recording, but the price point is so low. Well worth it I think. It is amazing though that the Rory bargain box set that Sony put out was the hottest selling set in the series — in New Zealand of all places, a country Rory only rarely visited. Go Kiwis!! I’m curious then about the demographics. Where is the market strongest for Rory releases or re-releases? Daniel Gallagher: Europe in general is still the biggest Rory ‘market’ with the UK, Ireland, Germany and France at the top. Outside of Europe; in Japan he remains very popular and now New Zealand! Looking at a royalty statement though it’s amazing to see how far his music stretches around the globe with CDs and downloads being bought everywhere from the Arab Emirates to Taiwan to Poland. I think that’s in huge part to the internet which has led to people discovering Rory and his music on youtube and Facebook etc. Shadowplays: You got to wonder how big Rory would have been if he had been touring in this internet age we live in. Music industry analyst and critic, Bob Lefsetz recently remarked that it use to be that you toured to promote your album, but now it’s all about the tour, and nobody toured longer, harder or better than Rory. So this month the last of Rory’s solo albums – Stagestruck, Defender, and Fresh Evidence have been remastered and released. How are these different from the previous releases? These weren’t remixed or remastered in the late 90’s were they? Any additional tracks? Daniel Gallagher: Stage Struck has it’s original artwork restored and on all the albums there’s some interviews / reviews added to Donal’s sleeve notes and more photos. Stage Struck also gets another bonus track as I found ‘Hellcat’ on the master tape which had been held back from the album for a giveaway promo single. I placed it with the other bonus tracks in the middle of the album as that’s where it was on the master tape. I’m not sure how much tinkering or mixing was done to these albums back in the 90’s but the mastering is much better, in my opinion, it’s less aggressive / loud and I think you hear the intricacies of the musicianship clearer. Shadowplays: This last batch seemed to have taken a bit longer to be released than originally planned. Weren’t they expected out in June? Daniel Gallagher: At first I wasn’t sure that we’d release these last 3 albums, as I mentioned I didn’t know if they’d been mixed differently in the 90s. Then I saw some comments and posts from fans saying that they hoped these albums would get the same treatment as the others and it did feel a bit incomplete to go back to the original artwork, mixes etc on all the other albums and leave out these three. I’d gotten a release month of June for the albums from Sony but then Kickback City as a release started to happen so everything got slightly put on hold, hence the few months extra. 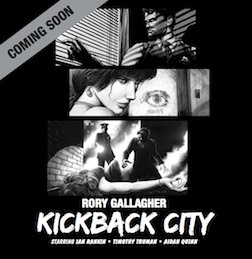 Shadowplays: And on the heels of these reissues you’ve just announced the other day the release in October of a very special project, titled Kickback City. Named after one of Rory’s crime songs. What’s the story? Daniel Gallagher: My Dad had always mentioned the idea of doing a compilation of Rory’s crime based tracks. While working on Wheels Within Wheels with Tony Arnold he was asked to write the foreword to a crime novel called ‘Low End’ by Harry J Pellegrin (who’s also a guitarist and Rory fan). While Donal was writing the foreword Tony mentioned to him that he had “A Question Of Blood” by Ian Rankin as an audio book in which the character Rebus listens to Jinx and signifies ‘The Devil Made Me Do It’ with his current case. Donal saw that these crime writers had picked up on Rory’s lyrics and crime songs and wanted to do a release based on these tracks. Shadowplays: I’ve read Harry’s two crime novels. He’s been a Rory fan for ages. He also built his own version of the Rory Replica Strat. Kept the hardware outside in his backyard to get it good and rusty! Ian Rankin is considered the top crime fiction writer in the U.K. How were you able to corral him? Daniel Gallagher: When Donal found out that Ian Rankin was a Rory fan and had tied in some Rory tracks with his Inspector Rebus novels, Donal got in contact with Ian’s publishers to thank Ian for mentioning Rory in his novels and mentioned that Rory had been very passionate about crime fiction. Ian replied but was unaware of Rory’s reading habits and the influence they had on his songwriting so Donal sent him a collection of Rory’s crime songs and mentioned the idea of him writing the sleeve notes for a crime compilation. Ian was very open to the idea so I cheekily recommended to my Dad to ask Ian if he’d write a short story using Rory’s lyrics instead of just sleeve notes. Amazingly Ian agreed, we sent him around 50 Rory tracks which had some crime reference, plus the lyrics for these and he in turn completely surpassed anything we could have imagined with his story The Lie Factory. Shadowplays: He’s referenced Rory in several of his Inspector Rebus novels, including his latest, “Standing in Another Man’s Grave.” I wonder if he sees a bit of Rory in his Rebus character? After all, Rebus tends to go a bit “Against the Grain” too. Daniel Gallagher: Ian mentioned that Rebus would be a fan of Rory’s in part because of it’s working class roots, no nonsense or frills attitude etc. Also I’m sure Rebus would feel there’s a Celtic connection between himself and Rory. It’s weird talking about a fictional character as if he was real. Shadowplays: Tells you how good a writer Ian Rankin is when you start thinking about whether the character Rebus would like this or that kind of music! Ian Rankin’s first “Rebus” novels were published in the late 80’s. Being such a voracious reader of crime fiction I wonder if Rory was aware of Rankin’s stories. Daniel Gallagher: We just collected together all of Rory’s crime books for a photo shoot and there was a couple in there I think, ‘Witch Hunt’ I remember seeing. The photo shoot is for a double-sided poster I’d like to make which is Rory’s Strat in front of his book collection in full, actual size both back and front. Shadowplays: Many of Rory’s later songs seemed strongly influenced by the hard-boiled fiction of Dashiell Hammett; not only the subject material but also the phrasings. Harsh, spare, and to the point. Does the Rankin’s novella quote some of the lines in Rory’s songs? Or the ideas behind the lyrics? 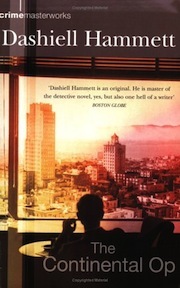 Daniel Gallagher: The story is written very much in the Raymond Chandler and Dashiell Hammett style that Rory so adored. It’s a subtle mixture of Rory lyrics and song titles that are in lines or are a characters names, for instance ‘Kid Gloves’ is a boxer in the story, much like Rory’s track. Daniel Gallagher: Definitely, when looking at the subtext to some of Rory’s later songs I think he does infer to the music industry as being the villain / mob type which he has to duck and weave in and out of to survive. Songs like ‘Kid Gloves’ where the boxing character is told to take a dive strikes me as Rory being told to release a single, it’ll earn him money but won’t help his soul. I think in Kickback City as a track you can really hear Rory’s despondency with having to exist in the business side of music where “You try to line all your lines and you try to play the part”. Shadowplays: Oddly enough, comparisons of Rory Gallagher with the Continental Op have even reached the hallowed halls of academia. A recent lecture given at New Saint Andrews College by Wesley Callihan, was partly about the similarities between Rory Gallagher and the Continental Op. Mr. Callihan suggested that “Perhaps Rory Gallagher was drawn to another character who was essentially alone, or who had to maintain a certain emotional distance from most people in order to do what he had to do the way he had to do it.” What do you think of Mr. Callihan’s interpretation? Daniel Gallagher: I showed that video of Mr. Callihan’s lecture to my Dad who was just blown away. It’s funny how his lecture came about just as we were putting the final touches to the Kickback City project. I agree with his sentiment of Rory being drawn to characters that are fiercely independent both professionally and personally. While Defender as an album title for instance came from a blues background I think Rory was aware that it, like ‘Last of The Independents’, is a title that that evokes the idea of himself being out on his own, fighting his corner against an industry he had to work in but didn’t feel a part of. Shadowplays: Ian Rankin’s novella is being illustrated by Timothy Truman, a well respected graphic artist whose credits stretch back to his days with DC comics. He is also a musician and Rory fan and has done artwork for The Grateful Dead, Hot Tuna and Jim Lauderdale. Why Truman? And did he need much coercion? Daniel Gallagher: Timothy Truman’s involvement came down to you actually! 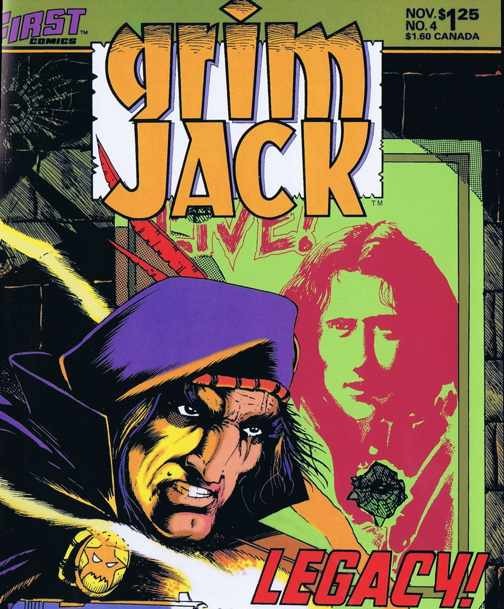 I read your interview with him on shadowplays.com and saw his drawings of Rory from his Grimjack comic. I’d showed the interview to my Dad and when Ian agreed to write the novella and explained it would be a Chandler/Hammett esque detective story we both had the same light bulb moment that it would be amazing if we could get Tim to illustrate it. Thanks to yourself we were able to email Tim and he was very excited at the prospect of what the project could be. We flew out to meet him in person and had a long chat about all things Rory and Tim’s art etc. As soon as Ian had sent over the novella we passed it on to Timothy to start coming up with the look of the characters and scenes. Tim did an incredible job, the front cover alone is a thing of beauty and special thanks also goes to the art director Mark Jessett who worked closely with Tim on all the finest details to capture the mood and feel of Ian’s story and characters. Tim really went above and beyond to supply us with so many wonderful illustrations and details for the album. Shadowplays: That’s the spirit of Rory coming into play I think. There are some good graphic artists out there, but when you’ve got one that is also a passionate Rory fan then I think that passion crosses over into their art and then you’ve got a really great graphic artist and some really great results. 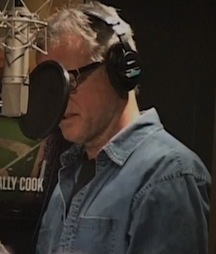 You’ve also gotten Aidan Quinn to do a narration of the story. He’s seen regularly over here in the States in the TV series ‘Elementary’, a modern take on the old Sherlock Holmes stories, and he’s also been in some topnotch movies; such as, Unknown, Legends of the Fall, Michael Collins, Desperately Seeking Susan. What’s the Rory story there? Daniel Gallagher: When I read Ian’s novella it had a real film noir feel to me and I thought it would make a great audio book if it had the right voice narrating. We’ve been working with cinematographer / director Declan Quinn for a while now on a potential Rory film and I asked him if there was any chance that his brother Aidan would be interested in narrating Ian’s story. I sent over the Lie Factory and Aidan liked the story and next thing I was on a plane to New York to record him. I was pretty nervous as I’ve never done any work on an audio book before but meeting Aidan was a pleasure, it was an odd situation for me to be ‘directing’ him as I was a little out of my depth but he was exceptionally professional and took the story to another level. I was expecting that he’d want to just read the story straight in his voice but he’d actually worked on different voices for the characters and little intricacies in their accents. It’s funny now when I read any of the novella I have Aidan’s tone for the main character Regan in my head. Shadowplays: Aidan was also in a movie directed by his sister Marian Quinn called 32A, a very good coming of age movie that also had a Rory Gallagher tune in it — “I Fall Apart”. And if I have my facts straight, his brother Declan was at the New York tribute to Rory back in ’02 at the Bottom Line. The Quinn Family — Actors, Directors, Cinematographers, and Rory fans all. I definitely sense a possible movie here, Daniel! Daniel Gallagher: Yes Declan got in touch with Donal a few years ago with his idea to make a film on Rory. He’s been working on several re-drafts of scripts in between all the films he works on. It’s still early days but I think the script is close to being finished and then begins the work of finding a film board who want to back the production I think. Shadowplays: There’s also a connection between Aidan Quinn and Timothy Truman, by the way. Timothy got one of his first big breaks illustrating the Jonah Hex comic book series, and Aidan played General Grant in the movie version of Jonah Hex. It’s karma! Daniel Gallagher: Yes! There’s always some weird connection when working on Rory’s music some intangible force, such as the timing of your interview with Timothy just when Donal was talking with Ian Rankin. Shadowplays: And that’s about the time I started reading Ian Rankin’s books! I had heard that he was mentioning Rory quite a lot in his books and so picked one up and liked it so much I’ve read them all! Along with the novella and the audio CD narrated by Aidan Quinn, you’ve also included 2 CDs of songs. Both studio and live versions of the songs referenced in the novella. Are the studio cuts taken from the newly remastered releases? Daniel Gallagher: The studio cuts are all from the new remasters, even the Eagle Rock (North & South America) release has the Sony music masters. I’m sure there’ll be some tracks that people will feel I missed out, I was really caught on whether ‘Philby’ should be included because it’s such a great song but in the end I felt it was more a cold war, espionage theme rather than a crime based one. Who knows maybe Patrick McCabe might write us a story and we’ll get to do another one! Shadowplays: I noticed in your studio selections that you opted for the “B-Girl” version of Public Enemy no.1. Why? Daniel Gallagher: To be completely honest I didn’t have the track down initially as one for the compilation as when I first read the Lie Factory I didn’t pick up on Ian using a lyric from the song in the story. I only noticed it when going through the artwork files for the release so I had to quickly choose between the NFSF version and Top Priority. I probably went with NFSF version because of familiarity as I’d worked on that mix. Shadowplays: And the live cuts? Daniel Gallagher: The live side I remastered from the Live In Cork film, it’s the Defender period when Rory’s material was most heavily influenced by crime writing and it’s such a great concert that I felt it would make a nice bonus in the package. Shadowplays: A cracker of a concert with some great video extras, like the tour of “Rory Gallagher’s Cork”. These crime story songs really showcase Rory’s songwriting skills, don’t you think? Daniel Gallagher: Yes that’s hopefully something that people will pick up on when they listen to the tracks. We all know about Rory’s musicianship and standing as a guitar legend that it’s nice that his great songwriting is highlighted in this package. Shadowplays: Were you aware that last year one of the original Celtic punk rock bands, The Radiators from Space, had covered the Rory penned taste song “It’s happened before it’ll happen again” on their new album Sound City Beat? In an interview with Hot Press, Philip Chevron from the Radiators (and also the Pogues) mentioned that Rory’s lyrics were often overlooked because of his exceptional guitar work. I think we do tend to overlook his songwriting ability because that guitar was so damn good! Daniel Gallagher: I only saw that recently when you posted it up on Facebook. It’s a very different version, I like it but it’s weird not hearing Rory’s sax and guitar lines. Shadowplays: I think Chevron pared it down to highlight further Rory’s songwriting skill. I love it when someone takes a Rory song and moves it in a different direction. There’s a band called Moo, I think Dublin based, that turned Rory’s “Crest of a Wave” into a Rockabilly number. Blasphemy, I know. But it worked! Of course at the end of the day, you still want to go back and listen to the original “Crest of a Wave” and hear that paint-peeling slide!! And speaking of Taste, Daniel you know I’m not going to let you go until I get the latest word on a potential Taste release? Are you any closer to securing a deal with the labels about the Isle of Wight video, and/or the remastering and general spiffing up of the Taste catalogue? Daniel Gallagher: Still completely stuck with legal issues on Taste, sadly. The catalogue and rights for Taste belong to Polydor / Universal who aren’t looking to do anything with the albums etc. We’ve been trying to license the rights from them but they’re not being very helpful. In turn this halts the Isle Of Wight film as Polydor have the soundtrack and own the performers consent, which means that because Taste were exclusively signed to Polydor at the time of the festival they have to grant us permission to use the bands performance in the film. We have pretty much worked out a deal with Murray Lerner for the footage but need to sort the audio rights out, as any label who would look to release the film would want the CD rights as well. Shadowplays: That’s a shame! Give me a name at Universal and I’ll make sure his email box is stuffed with some choice messages! What about the Irish Tour anniversary issue? Are you still planning on releasing a special edition of IT ’74 including extra tracks, for next year? Are there full concert audios from all three concerts: Belfast, Dublin, and Cork? Daniel Gallagher: Yes I’m working on the Irish Tour 40th Anniversary release right now. At the moment the plan will be the main Cork concert in it’s full length and setlist order, I hope people don’t see it as blasphemy releasing IT’74 in a different order but my idea is to give the whole concert and a few tracks segue into each other, Hands Off goes into Too Much Alcohol for instance. I’ve been editing together the Belfast and Dublin shows and I think I’ve got close to complete sets for these and then I’ve got a possible 7-9 tracks from rehearsal/ soundcheck. All in all I think it might run to 7 CDs! I think The Who 40th Anniversary Live At Leeds Box Set and Deluxe Edition are a similar type of package to what I’m looking to do. Shadowplays: That’s fantastic news. 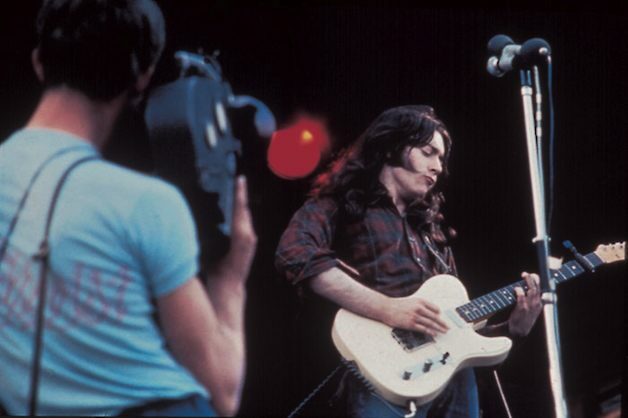 For a long time now, I think a lot of Rory fans have wanted full concert releases of some of the standout shows, like the Irish Tour ’74 shows, the Cowtown Ballroom show and Luton Town Hall show, to name just a few. It may take some getting use to listening to IT ‘74 in a different track order, but I think I can live with that so long as I get to hear gems like “Hands Off” and other newly added tracks from that Cork concert. Of course, you’ll have to promise to keep Mickey Connolly’s intro at the start of the concert! Well that’s certainly something to look forward to in 2014. Daniel, thanks for taking time out to talk about these latest releases! Donal mentioned once that it almost seemed like Rory had been airbrushed out of rock ‘n roll history. Yet today I find references to Rory everywhere: in music, art, literature, and poetry. In literature there’s the casual mentions in Ian Rankin’s Rebus series, and Joseph O’Connor’s novel Inishowen, where several pages are devoted to going to a Taste concert. And then there’s American author Jim Fusili who wrote a short story about channeling Rory’s spirit in “The Ghost of Rory Gallagher”. Poets Louis DePaor, Eamonn Wall, and Dermot Bolger have all written poems about him, and in music, artists such as John Spillane, Pat McManus, Jean-Pierre Froidebise have all composed tunes about him. We even have a bagpipe jig written in his honor by legendary Scottsman Gordon Duncan! In art we’ve had paintings of Rory and his guitar (and sometimes just his guitar) by such noted artists as Dutch painter Theo Reijnders, Irish American Mia Funk, and Scottish Renaissance man, Alec Galloway. Ireland it seems, and perhaps other countries as well, have refused to forget Rory and still holds him dearly to their hearts. And with the great work you and your father do in overseeing his incredible catalogue, perhaps one day we might see Rory get the respect he so richly deserves. Really looking fwd to Kickback City now. I “share” anything on Rory on my own Facebook page and have today ordered Live at the Cork Opera House, Montreux and pre-ordered Kickback City. I only actually discovered Rory about 2 and a half years ago and since then have been steadily buying everything I can, got about 22 items now. He really should be at the top of the tree or close to the top, brilliant brilliant musician, all round really nice guy from everything I have read about him. Thanks. I’d love to have a look at it. Is it online somewhere? Dino’s posting stuff on his website maybe it’s up there. Great interview, Milo!! It’s good to know Daniel and Donal are working hard to get us some new material. Still hoping for a Rory biopic and that Taste/IOW footage!! Ah, it was pretty average stuff to be honest and hardly a great insight to be honest. I’ll see if I still have a copy knockin’ around somewhere. Milo, great interview! Thanks for making the effort to conduct these interviews and post them for us all to read. One question; in your closing comments you made brief reference to the “Cowtown Ballroom” show as a standout. Did Daniel have any comment on that? I’m still hoping that someday the Rory estate gets possession of that master tape, cleans it up, and releases it to all of us diehards! Looking forward to the kickback city audio book/live cd etc, also the Irish Tour ’74 release .I hope Donal/ Daniel use the Japanese LP cover of IT74 as a stand out from other IT74 releases eg. the 1999 release as that cover was so not 1974. I’m loving everything Rory did, only discovered him over Easter weekend 2012 when I bought Live in Europe from HMV in Princes Street, Edinburgh, since then I have bought everything I could, even getting the remastered ones after buying the originals. He had so much depth to him and was so talented, he had so much more to give to the music world and his family. I tend to keep a CD in the car for 2-3 weeks before moving onto the next one, so its taking quite a while to “get through” them, plus I have a teenage daughter who likes other bands (rock fortunately) and so we have to compromise or she sulks. Currently (thank you Rory) going through some blues CD’s – Muddy Waters, got Bessie Smith in the car at the moment, have a Son House, Howlin’ Wolf, Tony Joe White, Robert Johnson, Big Bill Broonzy, Mississippi Blues, Acoustic Blues and Acoustic Blues Anthology to listen to as well. Have been a blues fan since I was about 14 when I heard Peter Green do Need Your Love So Bad by Little Willie John on the Pious Bird of Good Omen album, just knocked me sideways. So thanks Rory for getting me listening to stuff like that again. The blues has to be felt, and can I think only be really appreciated if you have had your heart broken – in my case by a sledgehammer I think. It gets right inside you, grabs your soul with both hands and takes a big bite out of it. Back to Rory, can’t wait for the 40th Anniversary Irish Tour DVD/CD. I don’t suppose there is much of Rory on Sax anywhere? 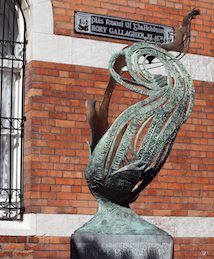 I was listening to Rory Gallagher and got to Can’t Believe It’s True and it hit me that Rory was playing sax, I nearly crashed the car, he was so bloody good at whatever instrument he set his sights on. Currently listen to Fresh Evidence before I go to sleep at night, I have Kickback City and went and bought a Dashiel Hammett and re-bought The Big Sleep by Chandler, my all time fave film, I didn’t realise Hammett wrote The Maltese Falcon – another fave film of mine, so I intend to read these soon. Think I have waffled a bit, I love Rory, wish I had heard of him while he was alive, absolutely gutted that he played the Apollo in Glasgow in December 1978 and I went in October and November to see other bands but no-one I knew mentioned his music or him so to me I wasn’t going to go and see an unknown (to me), wish I had as I would have found him a whole lot sooner and while he was still with us. I wanted to say Rory was one of last true bluesmen of our times. I really loved his style and his conviction toward the real meaning of music, and not caving into the commercial aspect of it all. Rory needs to be inducted into the Rock n Roll Hall of Fame…. Thank you Rory for allthe great music you gave & left us all with, your truly missed…..R.I.P Rory Gallagher…..